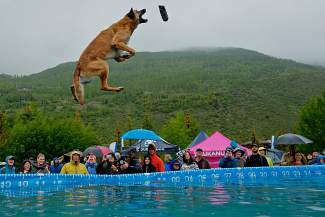 A small crowd braves the rain to watch Remy, a Belgian Malinois, catch the toy thrown by his handler Jon Langdon, of Arvada, during the GoPro Mountain Games' DockDogs big air final pro competition at Golden Peak on Sunday. Remy and Langdon together took first place in the competition with a jump of 25 feet, 3 inches. VAIL — Dog don’t care about rain. Dog chase toy into water. After seeing huge numbers over the weekend, the GoPro Mountain Games were pretty much on fire after Saturday, so a little rain was almost necessary to dampen the record-level stoke surrounding Vail. Organizers said it was the busiest day in the event’s 13-year history; conversely, on Sunday, the Dock Dogs main event drew the smallest crowd in the six years it has been in Vail. And when technical difficulties prompted a rain delay as the DockDogs Big Air main event was beginning, the few spectators that had waited in the storm could be seen packing up and leaving. But did the dogs notice the difference? “He couldn’t even tell,” third-place finisher Courtney Adams, who was visiting Vail from Glendale, Arizona, said of her Belgian Malinois, Whiskey. It was Whiskey’s first year competing in the Mountain Games, and at only 18 months old he’s still cutting his teeth in the dog jumping game, said Adams, who was sporting a quarter-sized purple bruise on her face during the competition. Whiskey jumped an estimated 25 feet to notch his place on the podium. We’re using the term “estimated” because the electronic, frame-by-frame capturing system ordinarily used to determine the length of the dogs’ jumps failed in the pouring rain Sunday, and a certified judge was called in to do it the old-fashioned way. The fact that a high-frame video camera feeding into a computer monitor in the judges’ booth is now used to determine distance is a testament to how far the sport of dog jumping has leaped since getting its start as filler material for ESPN’s now-defunct Great Outdoor Games nearly 15 years ago. And the Vail event has come a long way with it, winner Jon Langdon said after Sunday’s competition. Langdon’s Belgian Malinois, Remy, put on a spectacular show for the cameras. The big air competition sends dogs running off a dock and jumping into water to see who goes the farthest. In order to do this, the dog must be prompted, and the standard method used by the pros is to prompt the dog to jump by throwing a toy through the air and into the water. “The idea is to have the toy be just outside of the dog’s reach, so they’re striving to catch it and reaching to go further,” Langdon said. While the jump is then measured to determine the winner, Remy’s winning jump Sunday would have also put him on top if the competition were judged on style, as Remy actually caught the toy in mid air before hitting the water. Langdon is from Arvada so he didn’t have to travel nearly as far as the other pros in the field. Heidi Hayes, who placed sixth along with her dog Tucker, came in from Vancouver, Washington. To make it into the pro circuit, owner-dog teams must travel through the ranks, starting as amateurs and working their way into semi-pro and pro competitions. Last year’s GoPro Games DockDogs Big Air winners, Vail resident Benjamin Dale and his dog Flour, upset Langdon and Remy to take the top spot. This year, Dale and Flour didn’t make it into the finals, but in the semi-pro circuit Vail Valley resident Todd Scheurich and his Labrador Boudreaux took down the competition, some of whom had traveled from places like Iowa and Texas to take part. Learn more about competitive dog jumping by visiting dock dogs.com.